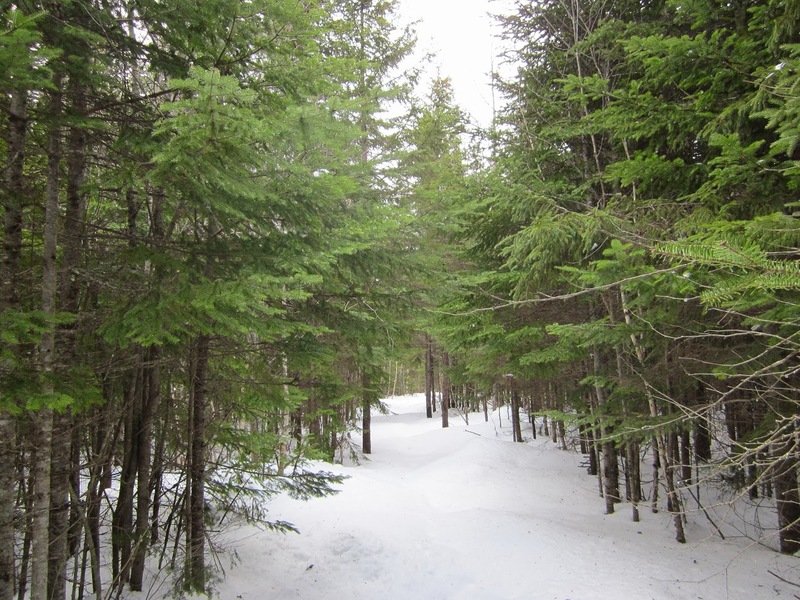 About 3:00 PM I was on the snowshoes, there was a little bit of fresh snow. 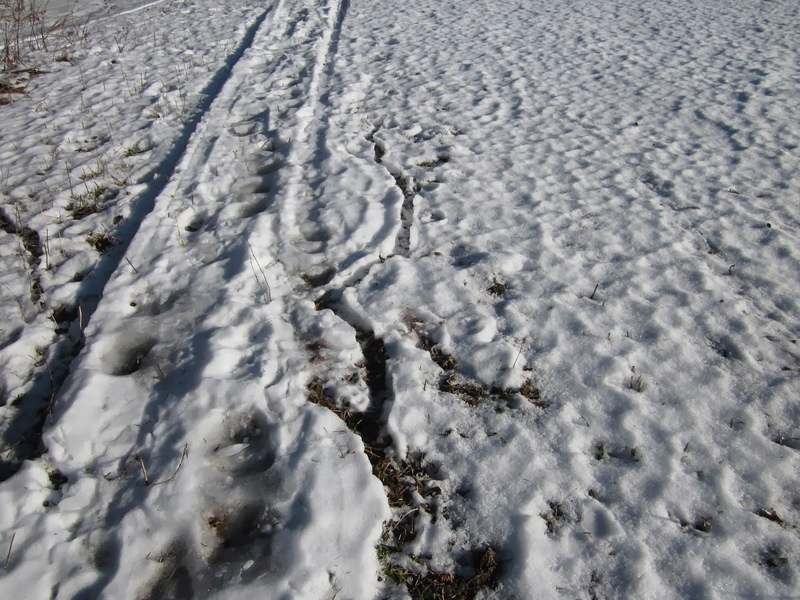 I believe these tracks were made by a rabbit. I went as far as the business park , then cut across a field to the creek. It was overcast with the temperature at zero when I was out. 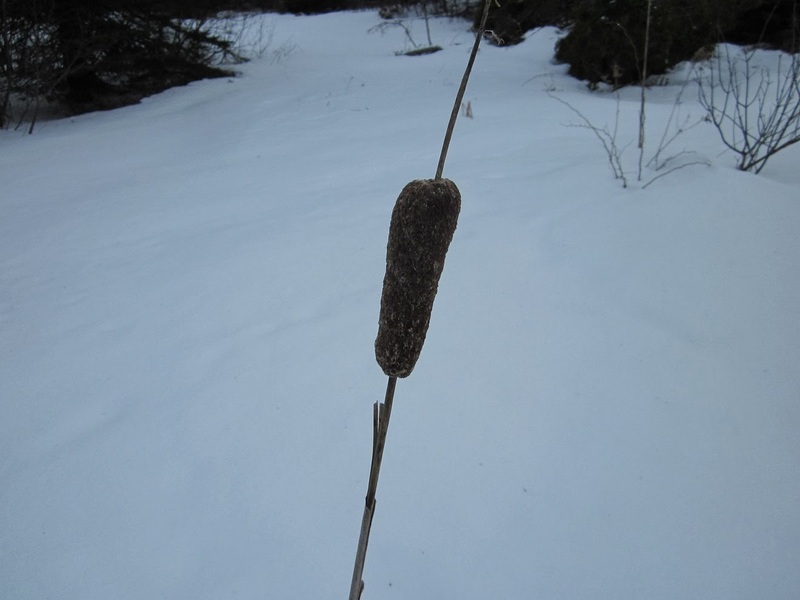 This lone cattail is holding up very well, considering it is now midwinter. 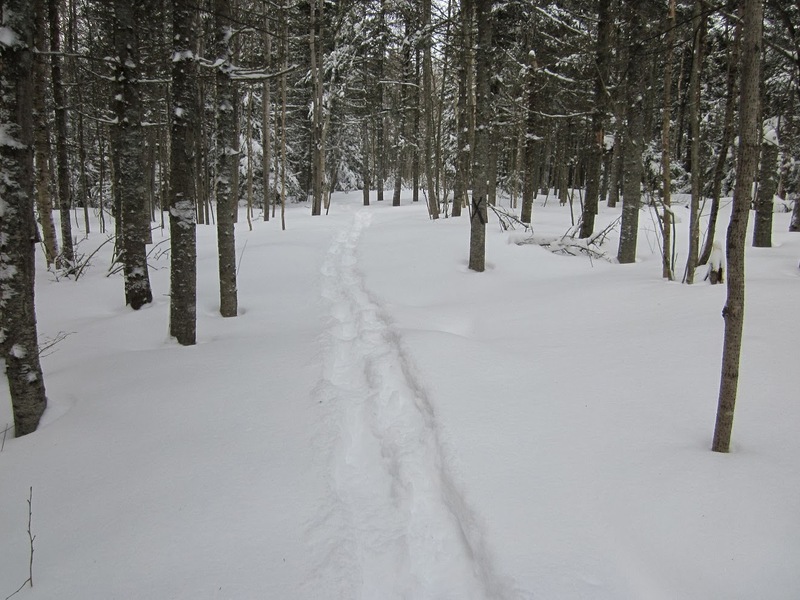 I was snowshoeing at Roma in the morning, this part of the trail not used very much. 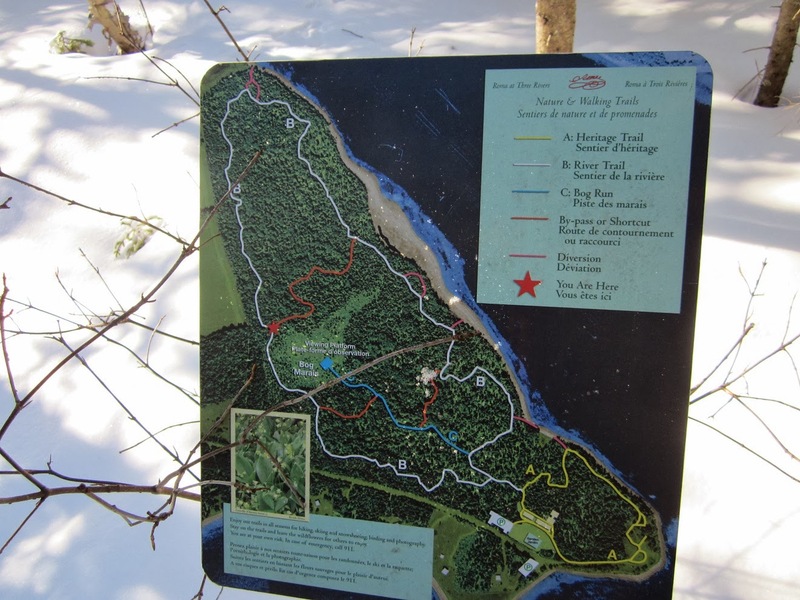 I went north on the red trail and back to the start of the trail, about 3 km. 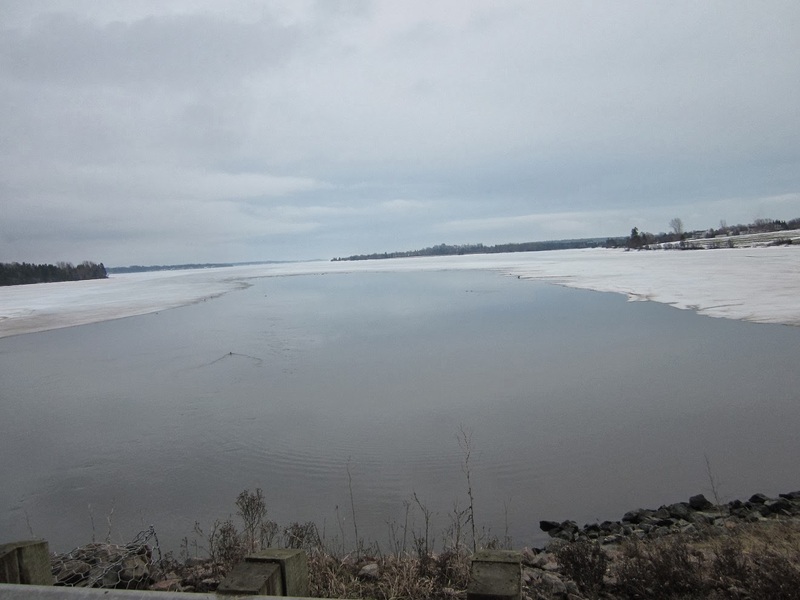 Looking across the river to Georgetown, the river is all iced in now. 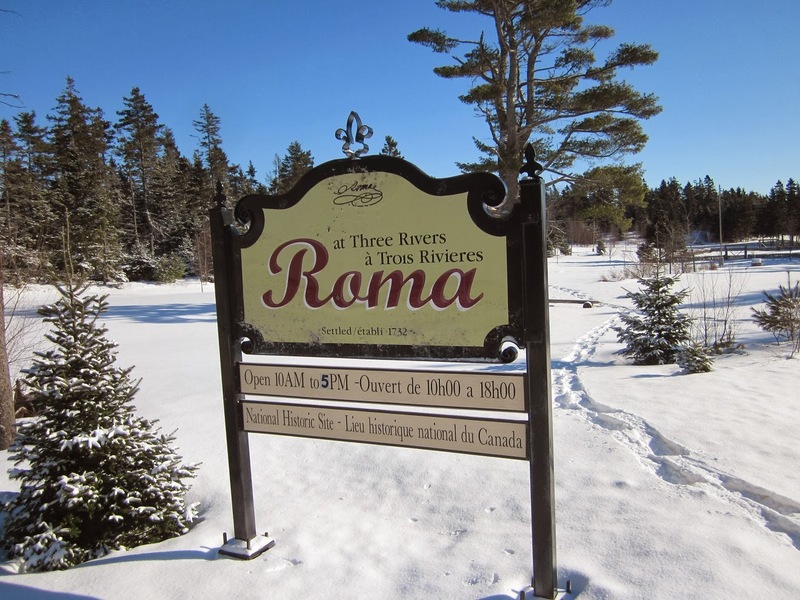 The Roma site is located at the Brudenell point. Sunny at -9 with light wind. 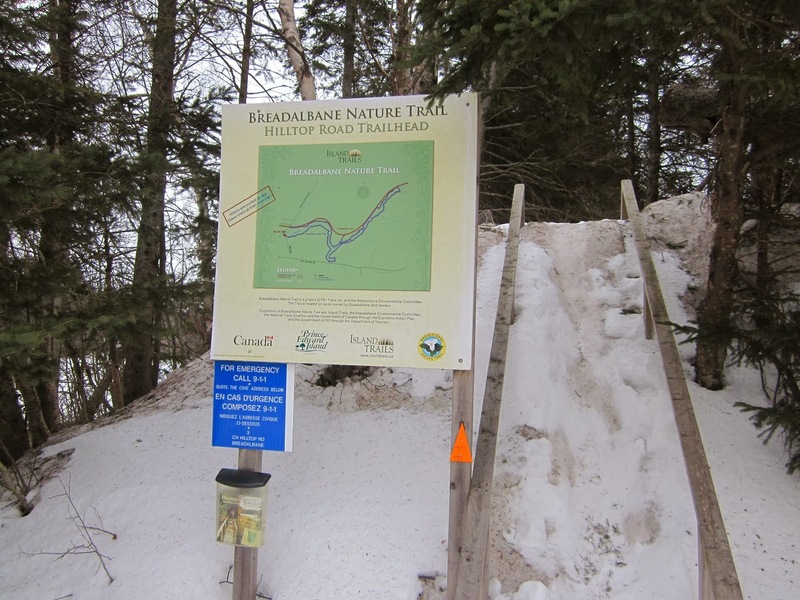 There were nine of us hiking the Breadalbane trail this morning. Not all hiked the full trail but I did the main loop, about 6 km. 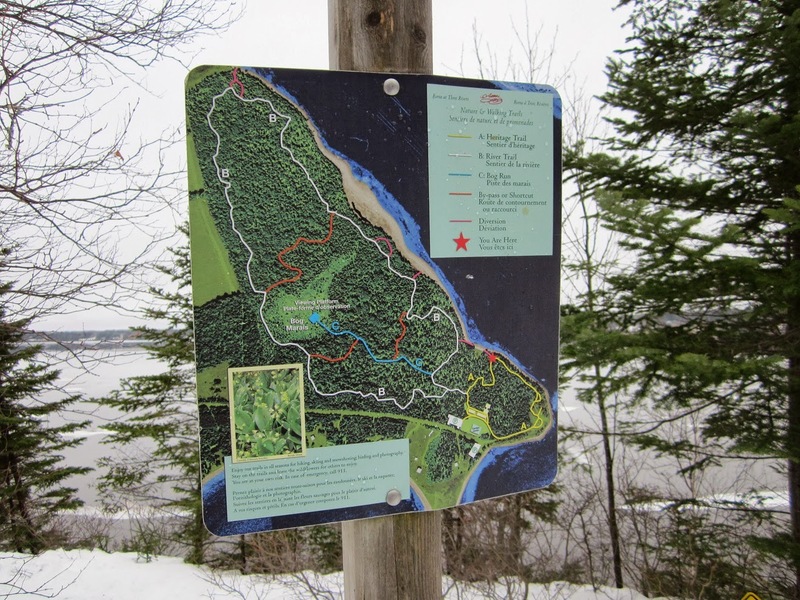 About half of the trail is on the south side of the river and the rest is on the north side. 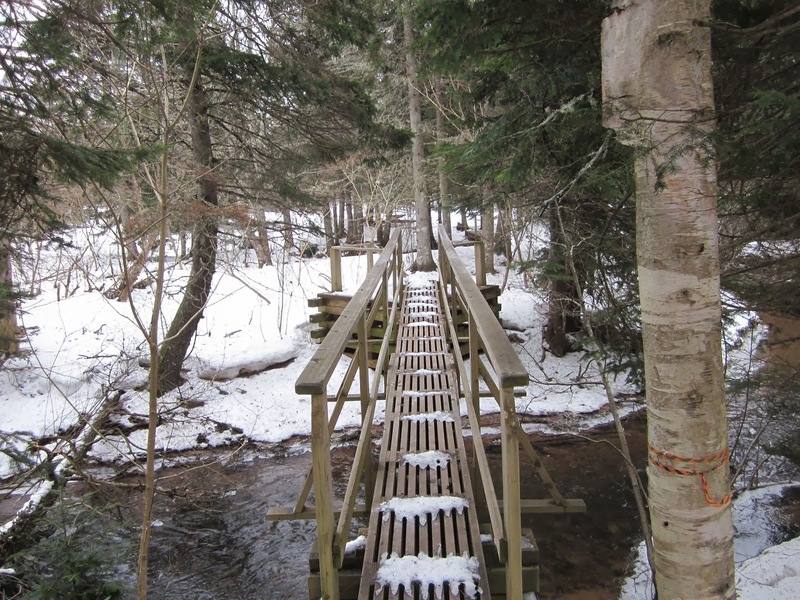 Excellent bridge to get you across the river. A good flow of water in the river for this time of the year, the recent rain has made a difference. Overcast at -10 after lunch we had some light snow, about 2 cm. 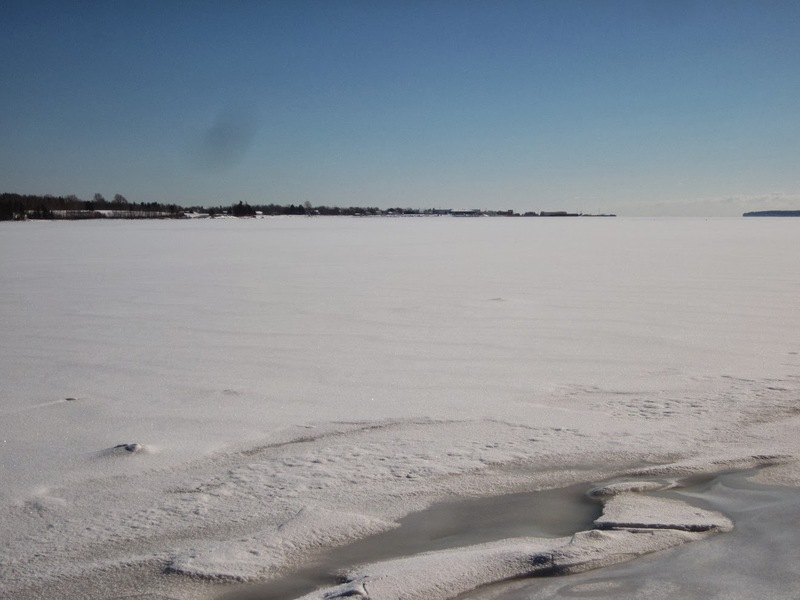 It was sunny at -11when I was out for a walk. 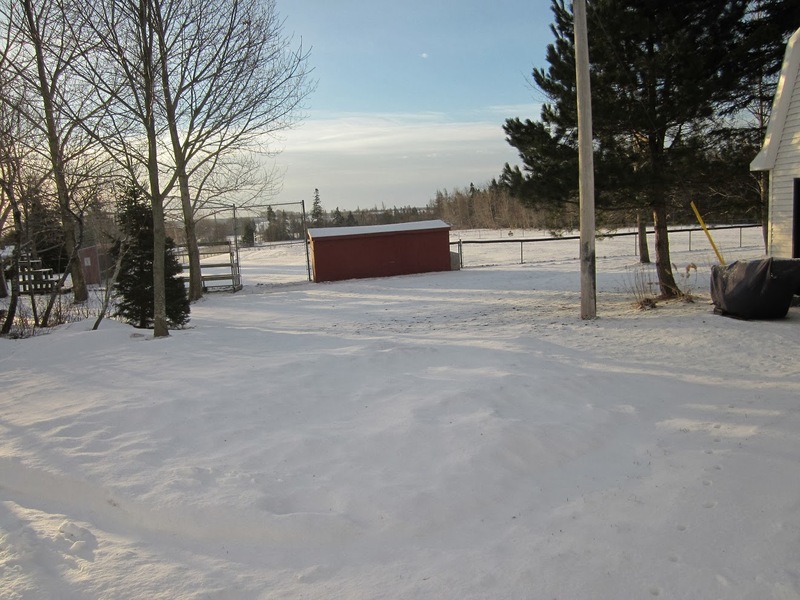 The rain last night has taken a lot of the snow. 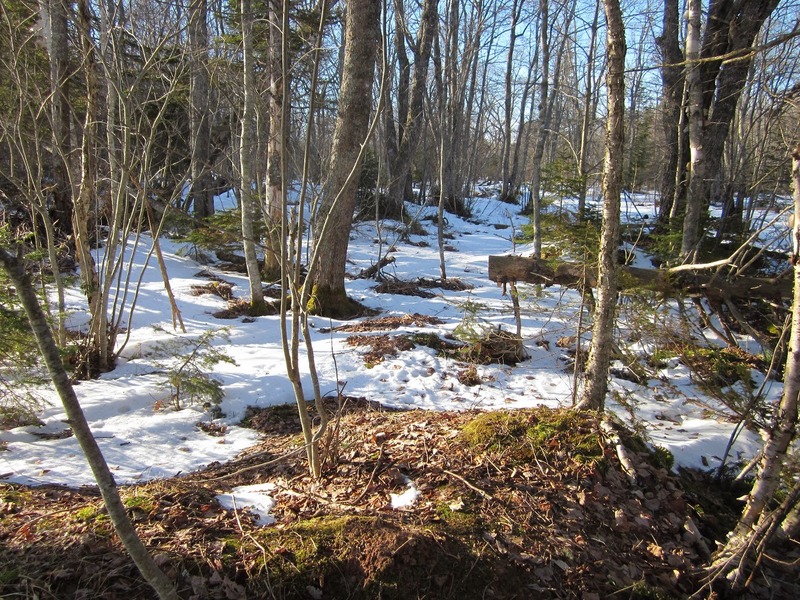 The field mice are missing their snow cover as well, with the snow gone I can see their burrows. 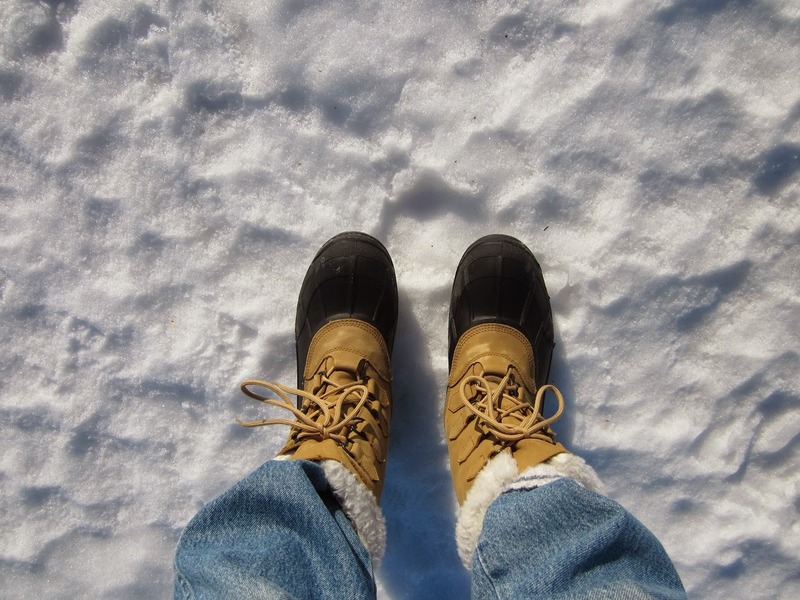 The snow is so hard and crusty there was no need of the snowshoes. 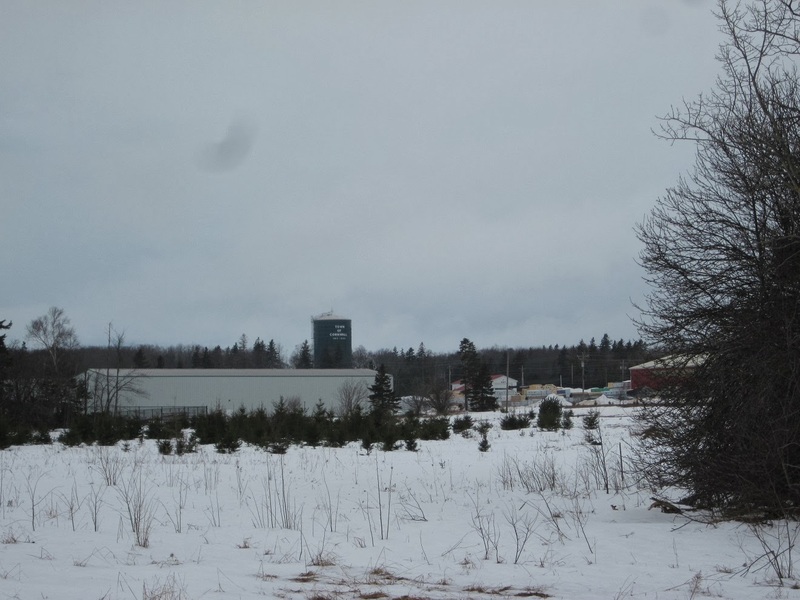 About 4:00 I went out on the snowshoes and went as far as the business park to the point that I could see the water tower. 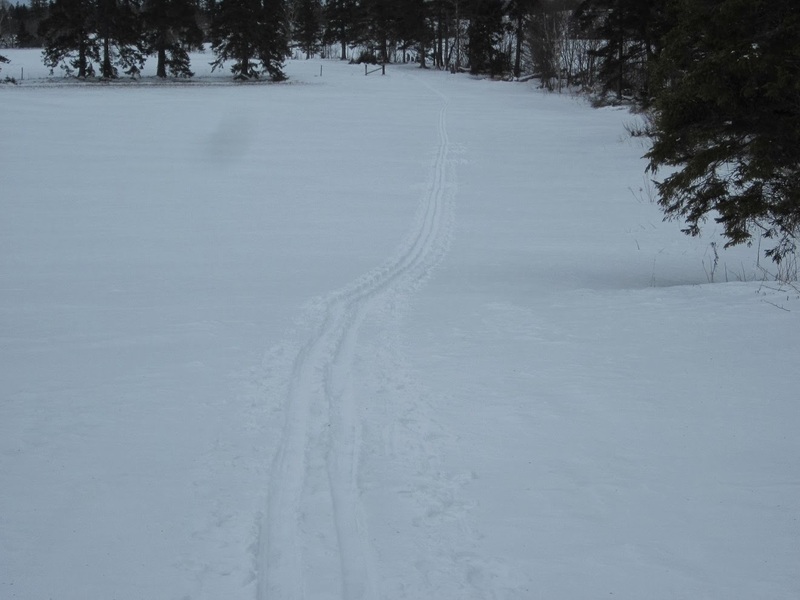 In that area someone was out on skis yesterday from the look of the tracks. I visited with the neighbors in the morning, then donated plasma over the lunch hour. 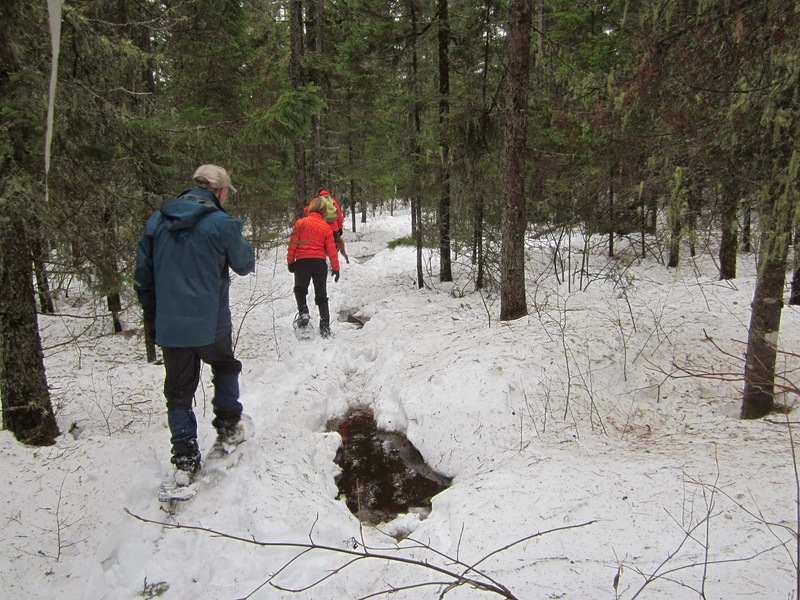 It was -14 last night and by 4:00 it was +2 and the rain just started as I was coming from snowshoeing. And the forecast the temperature back down to -12 by midnight. 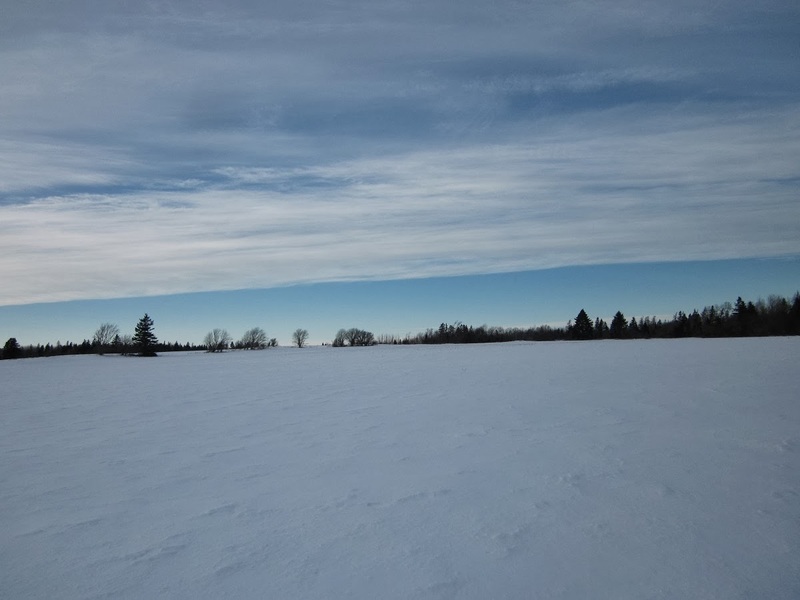 I was out on the snowshoes for 45 after lunch, the rain last night is eating into the snow, bare patches showing up in the fields. 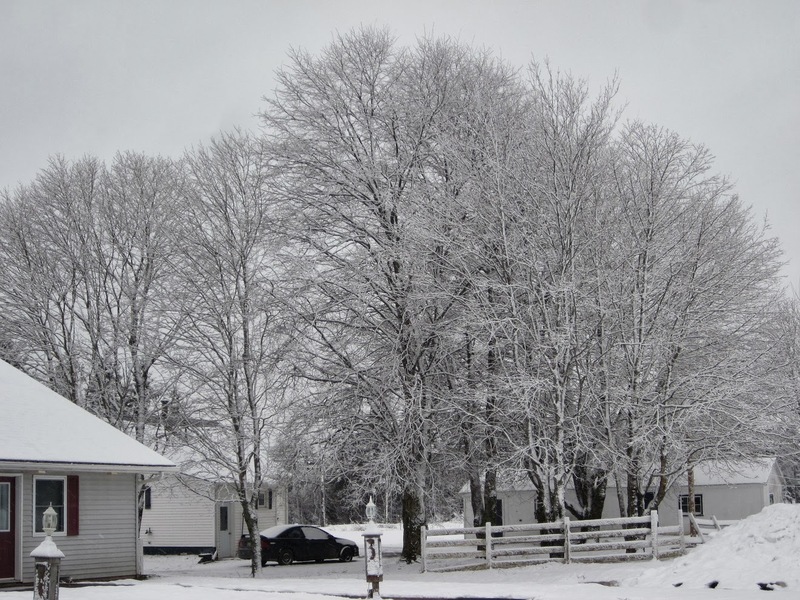 But the rain did clean all the snow of the trees. Temperature was +2 when I was out. 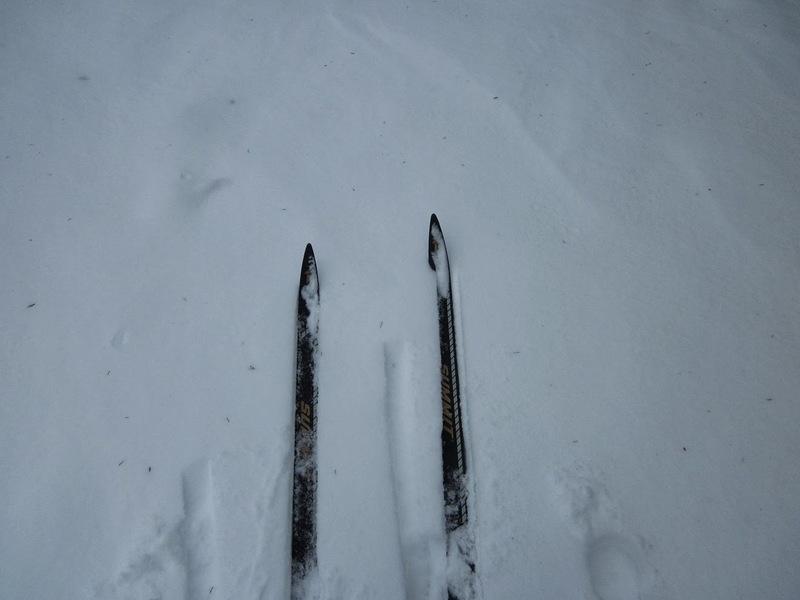 It was -18 overnight but by 2:00 PM it was up to -3 so I went out on the skis for a hour or so. 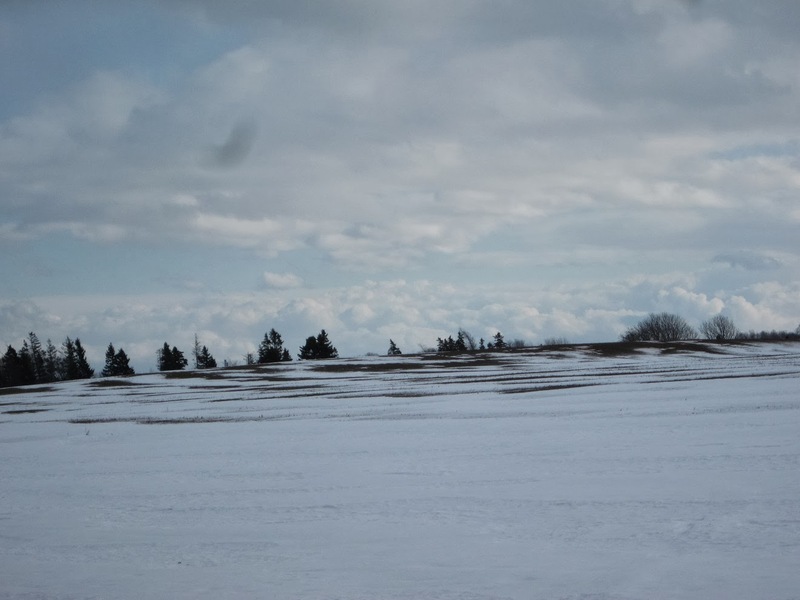 This is the hill that I ski down, after 8 runs I stopped increasing the distance I was going. You can see where I was turning after each run. This is what it looks like from the top of the hill, I would guess the elevation to about 10-12 meters. I had breakfast with the retired firefighters in the morning. 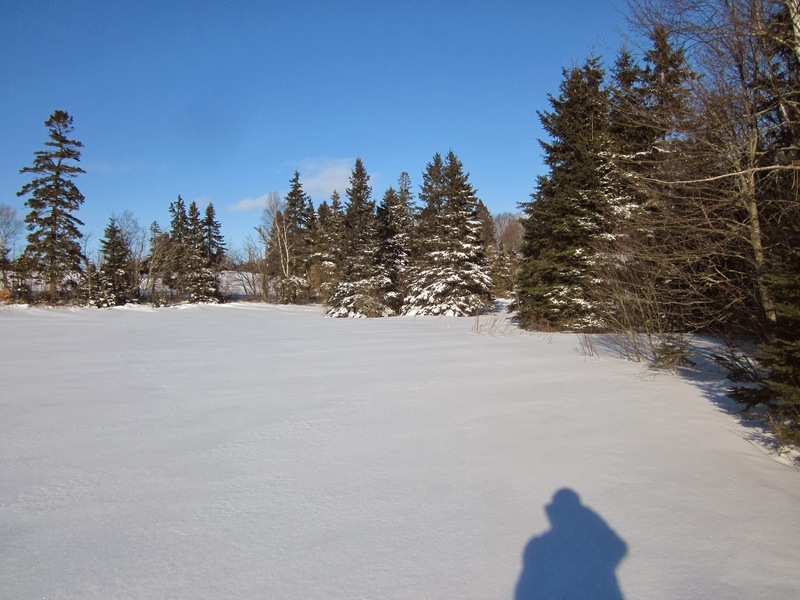 It was sunny and about -16 went I was out on the snowshoes. 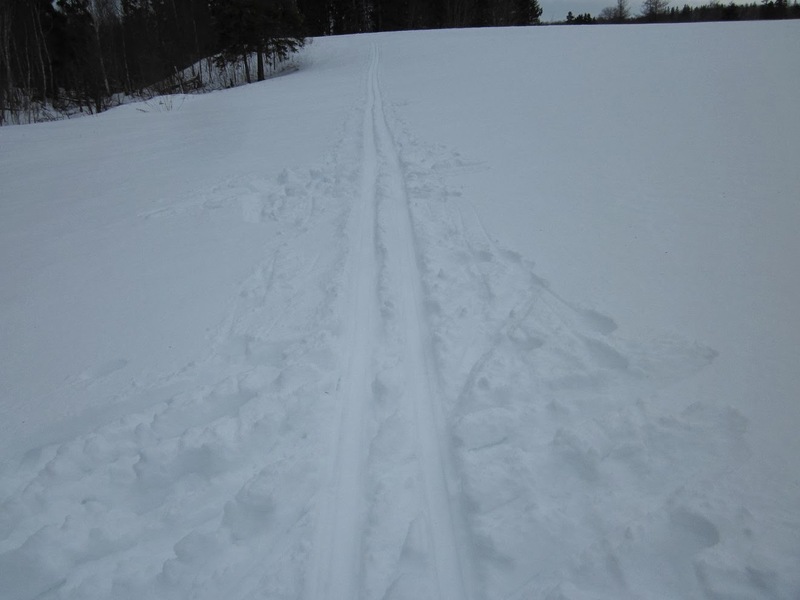 This track was made by a difference kind of snowshoe. 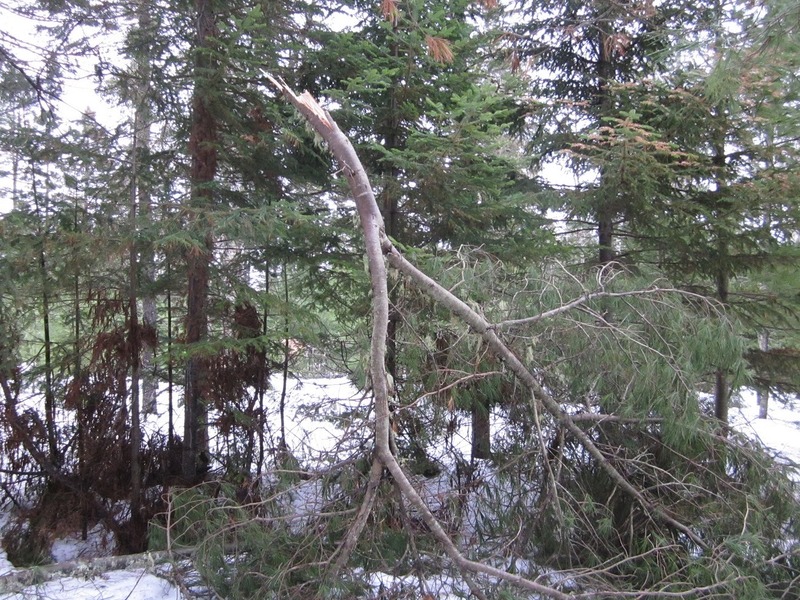 It is rare to see a spruce limb break like this. 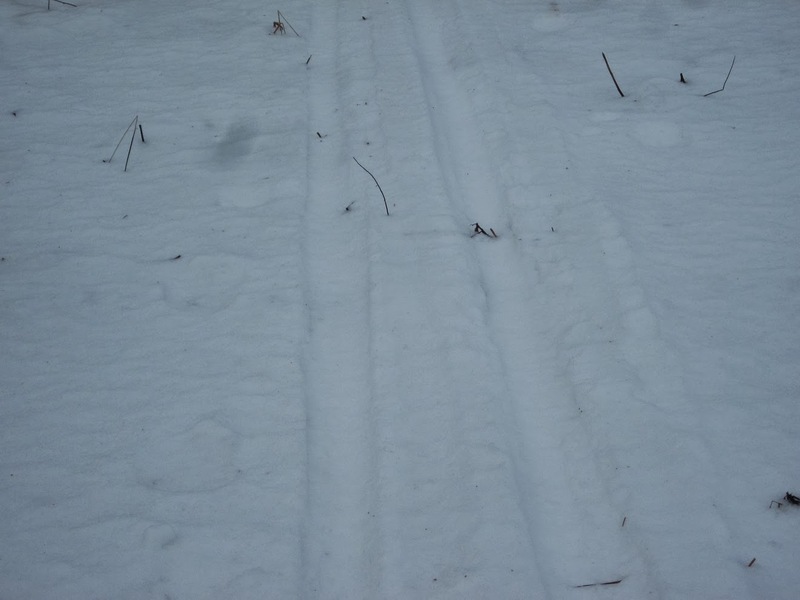 My tracks were the only man tracks that I saw in the fresh snow, the total snow fall was over 37 cm. 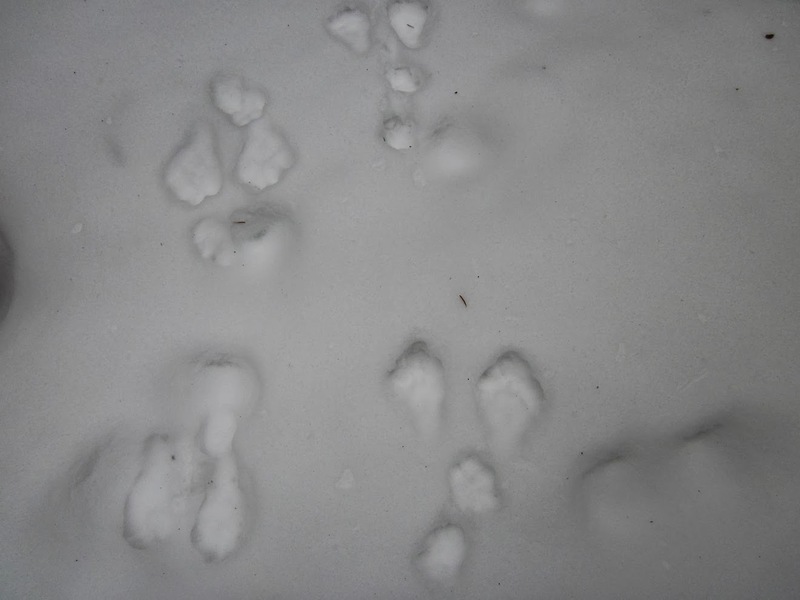 But I saw fresh coyote, fox, rabbit and squirrel tracks. I broke track as far as the business park, it was a lot easier on the return trip, I was out for about 45 minutes. One for the bridges on the trail. 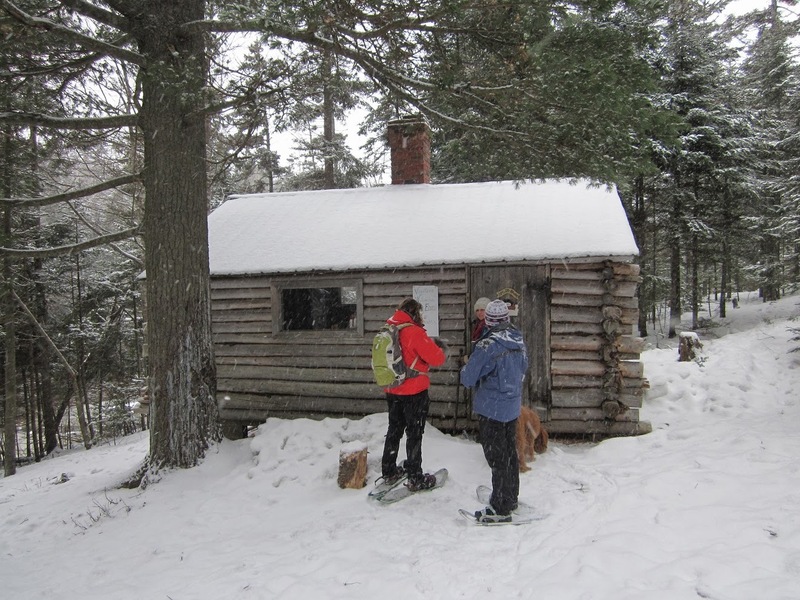 There is a log cabin where we had a rest, sign says no fires and no overnighting. 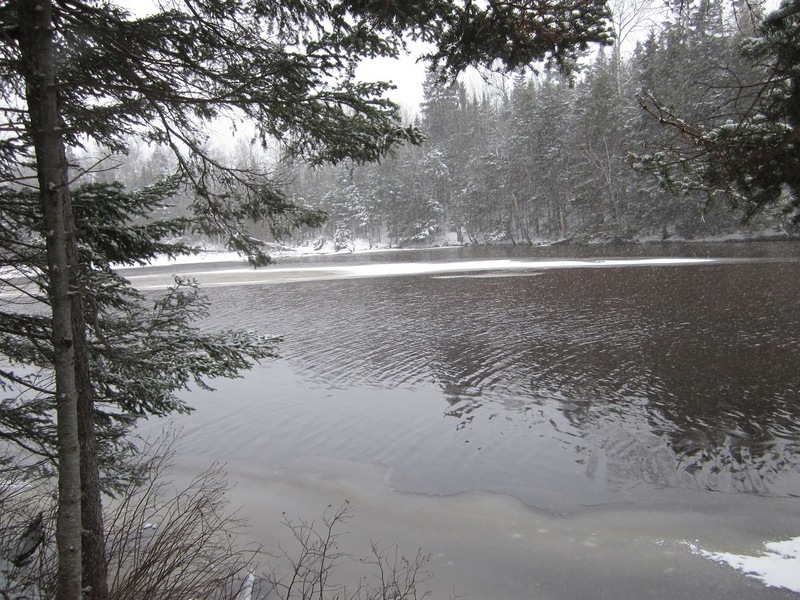 This photo taken from where the cabin is located, the river is quite wide here. Heavy snow started at noon, already received 20 cm with more to come. 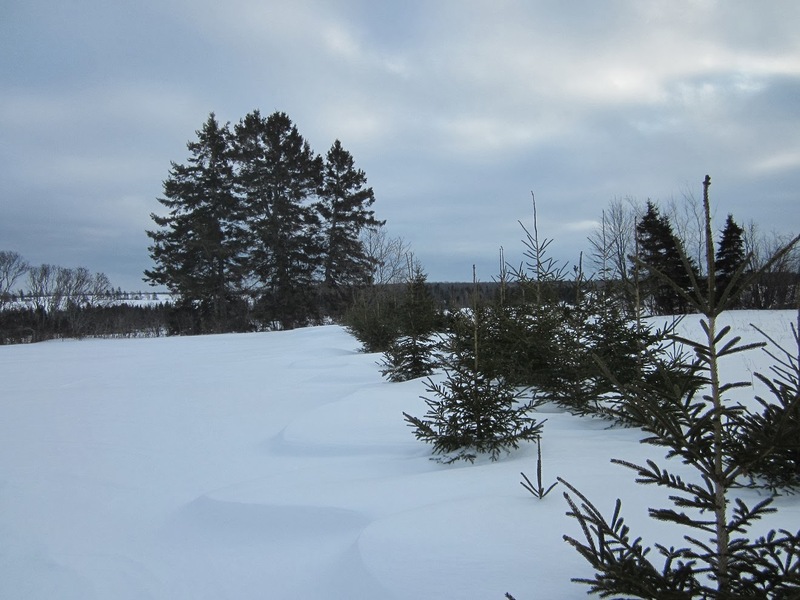 Wind is 50 gusting to 70 km/h so a lot of drifting. 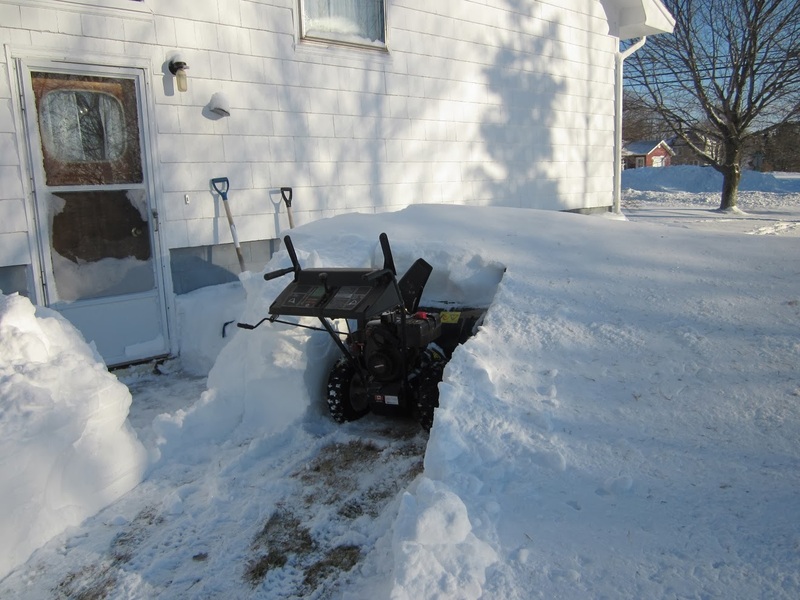 I will be using the blower in the morning. 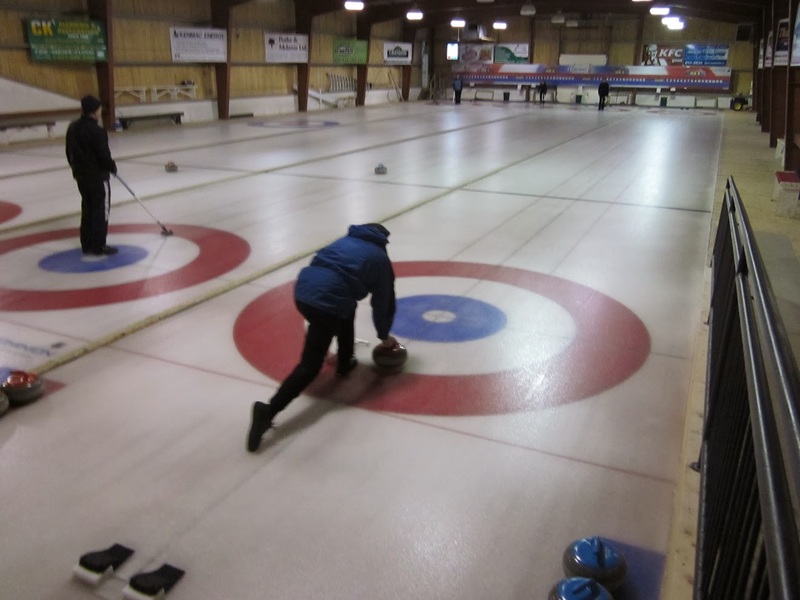 I was to the curling club this morning, it was my first game of the season. Our team was throwing blue rocks and did win the game. It was sunny at -14 outside and -1 inside on the ice. Late afternoon I was out on the snowshoes for a hour, mostly cloudy with a break to the north. The sun was shining at -2 at 8:30 this morning. I visited the neighbors at the chicken barn. I was going to cycle after lunch but then it started with a light snow. 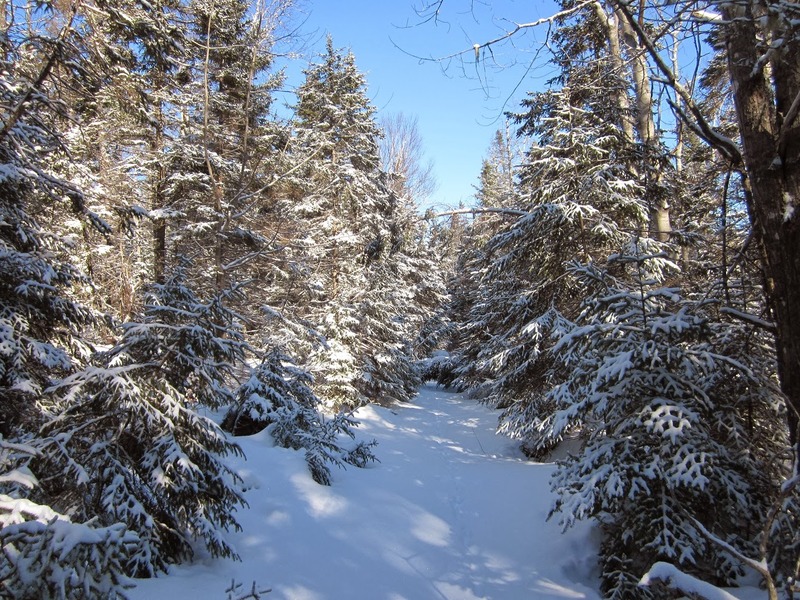 So I went on the snowshoes and did the long loop, about 4 km. 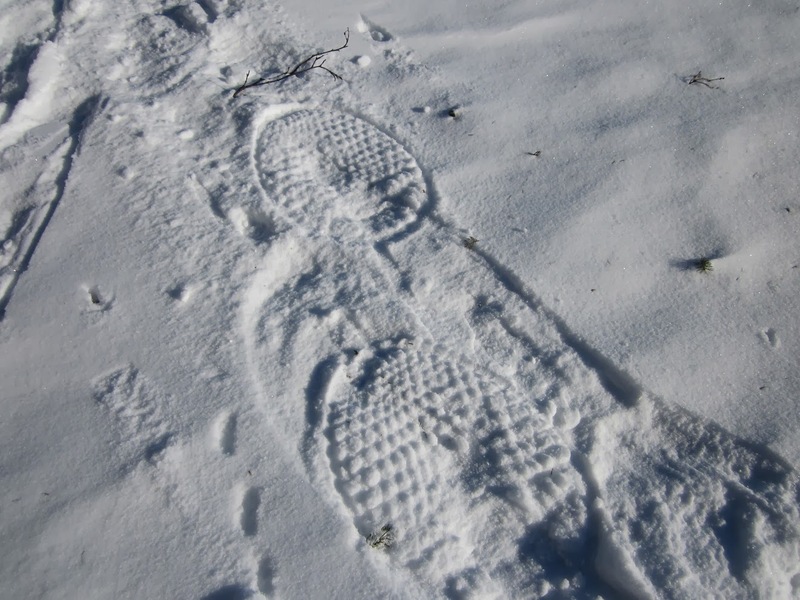 Temperature was zero so the soft snow made for poor snowshoeing, it kept balling up on the cleats. The last km was the worst, I could clean it off and 50 steps it was just as bad again. 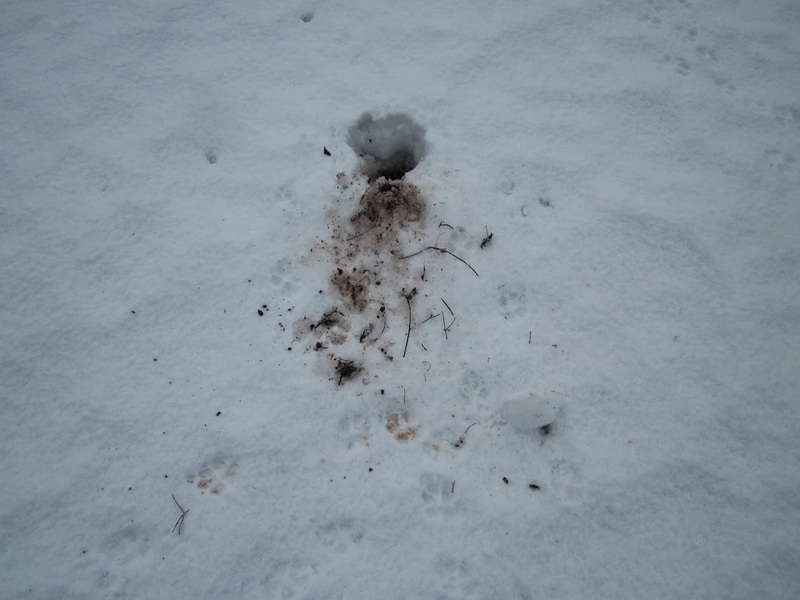 This is where a fox was digging out lunch, probably a mouse. 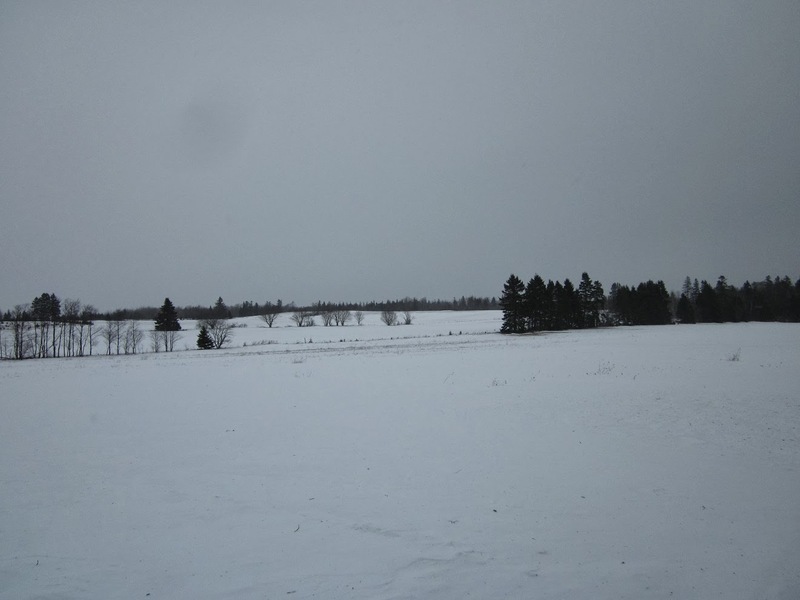 I was out the snowshoes for over a hour, overcast at +1. 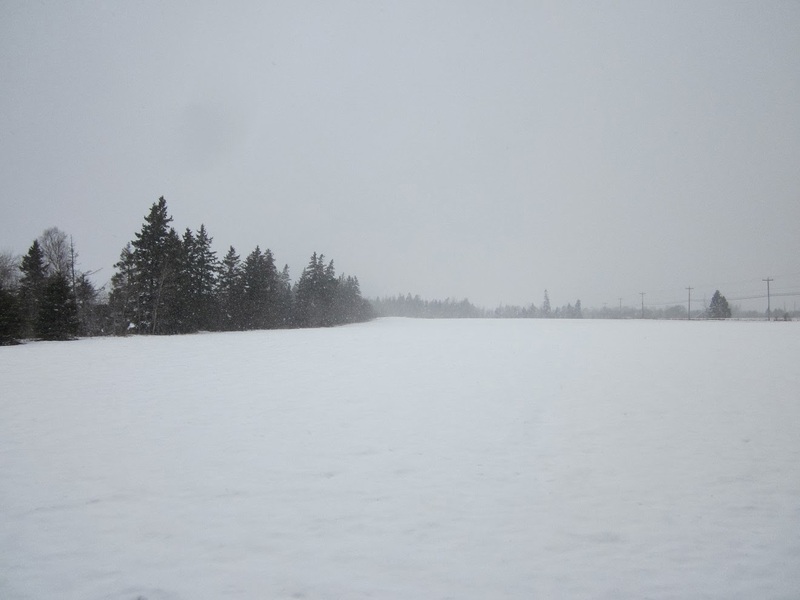 We had a bit of fresh snow, about 2 cm. 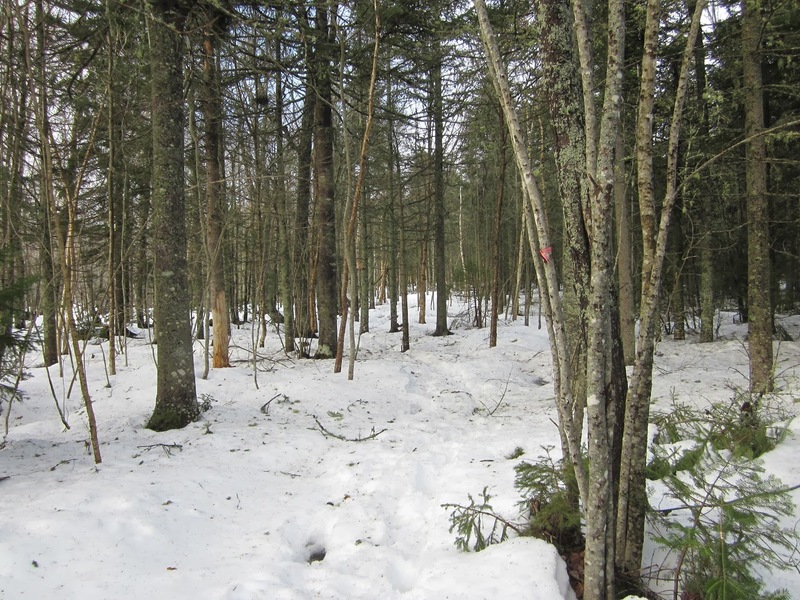 We were to Montague afterwards, a lot more snow on the trees there. 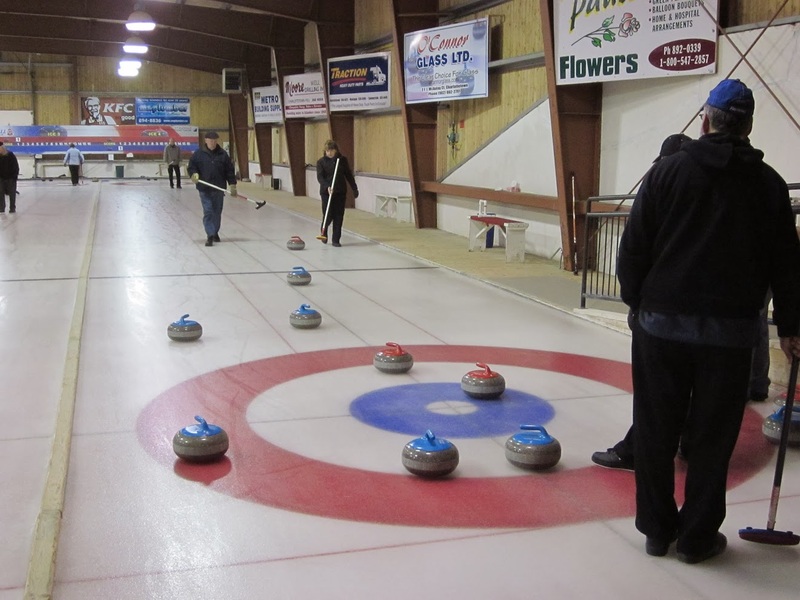 We then watched the curling before coming home. 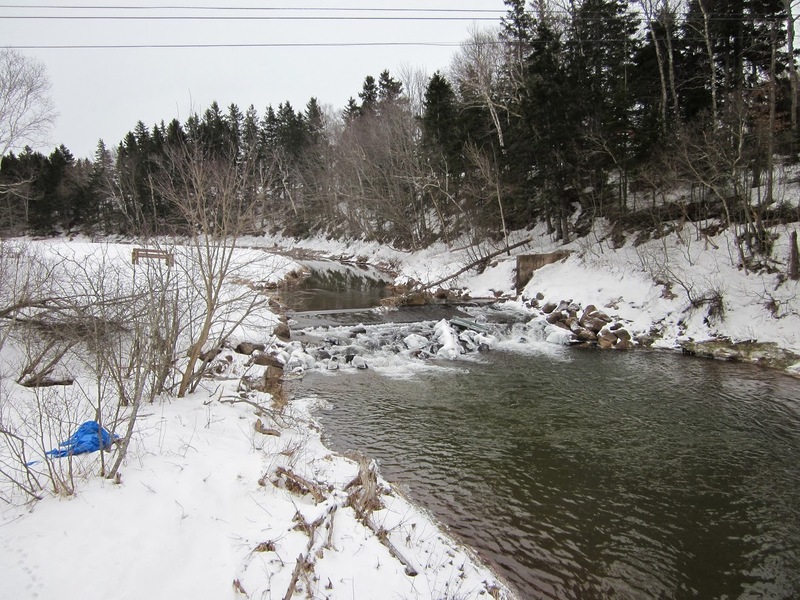 After lunch I was cycling, the channel at the North River bridge is already opening up. 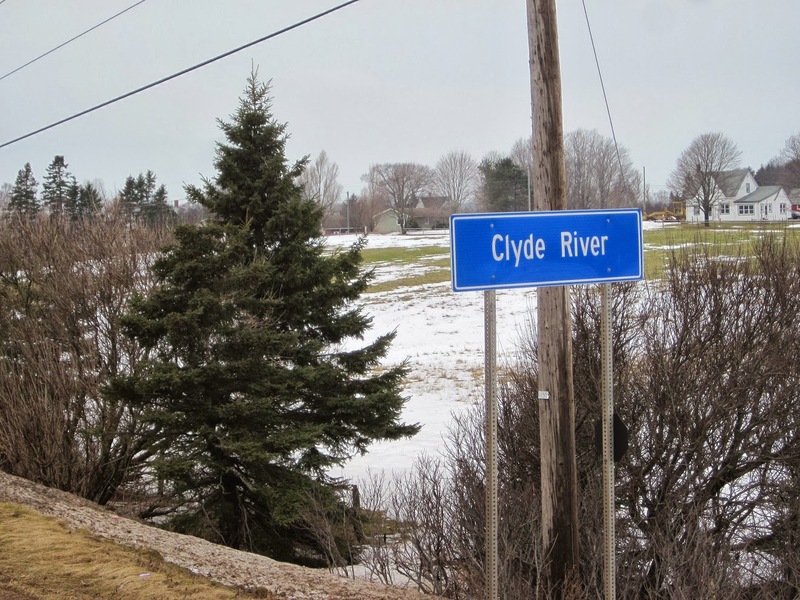 I cycled the highway to the Peter Pan intersection, then west to Clyde River, then home by the Ferry Road. 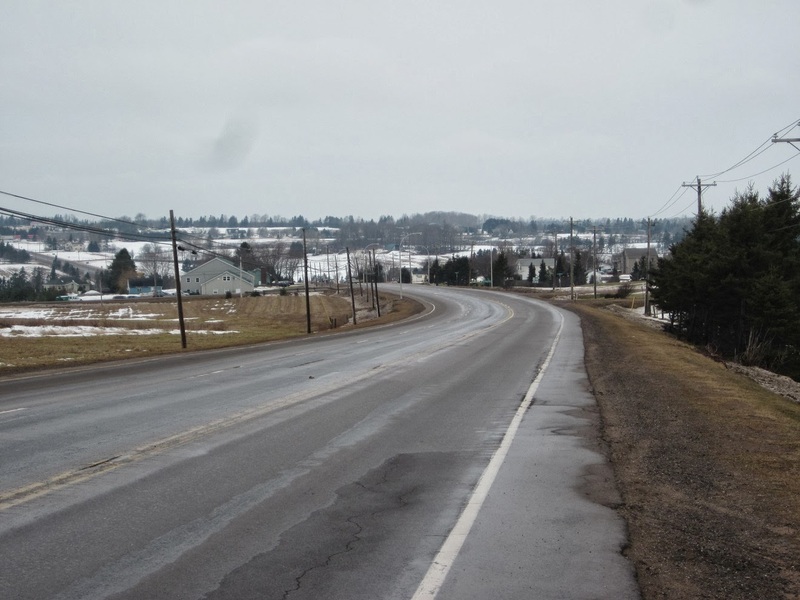 This is the highway looking towards Clyde river, the road was wet with a bit of drizzle at times, temperature was +2 with no wind. No wind is sort of unusual. 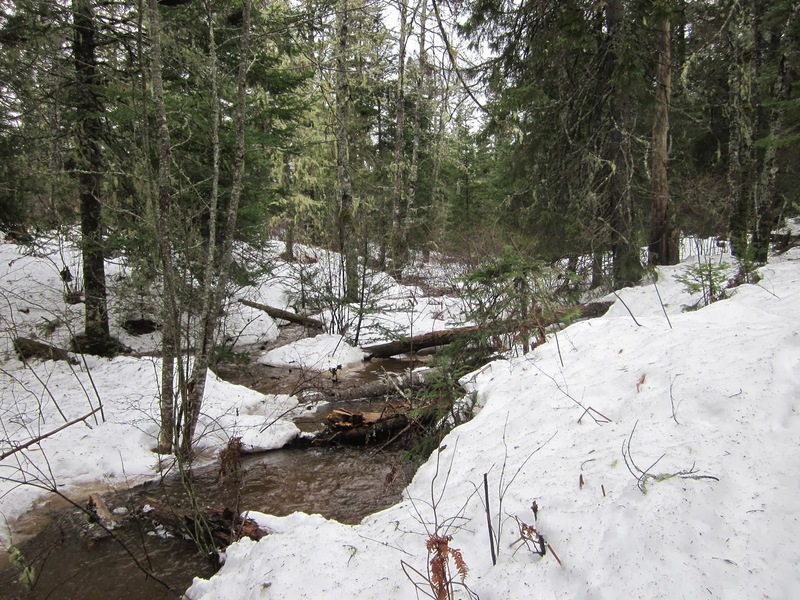 I was out walking after lunch, still lots of snow in the woods and very soft, sinking to my knees in places. Lots of water running in the little creek by the bridge. 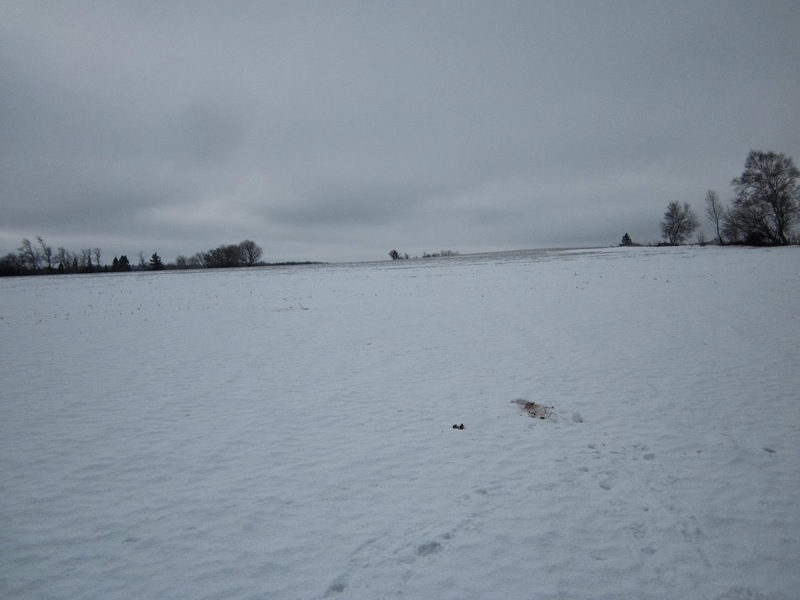 In the fields the bare ground is showing though the snow. Drizzle all day with the temperature around 1 and very light wind. 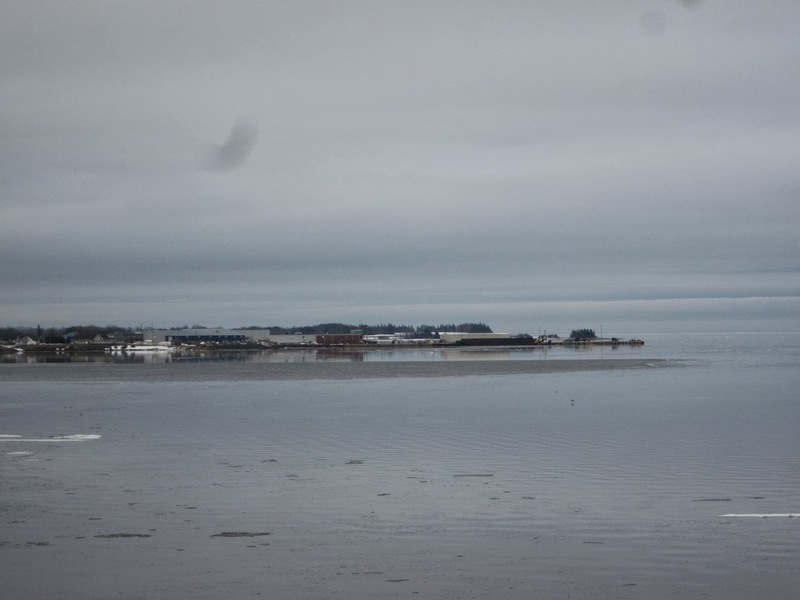 This is the view of Georgetown from Brudenell Point, note ice on the water, just some small ice pans. 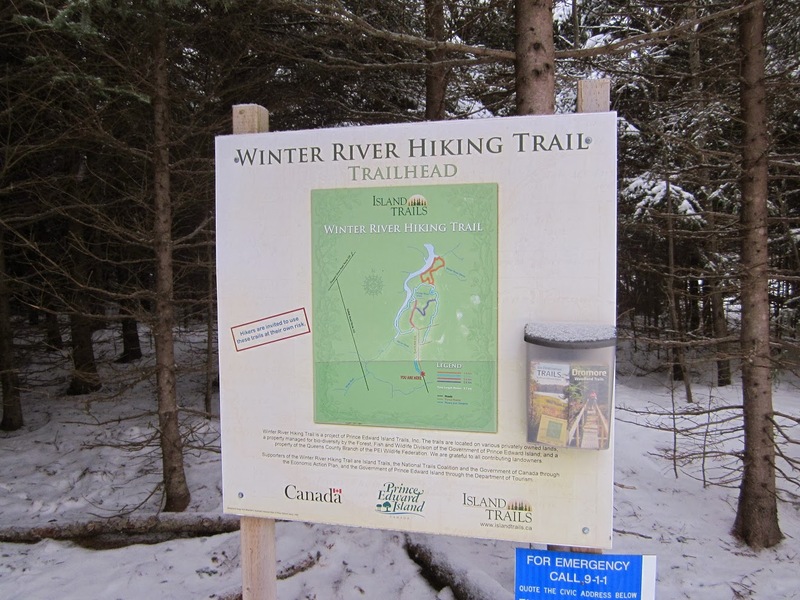 I was hiking the yellow trail and part of the blue trail this morning at the Roma settlement. 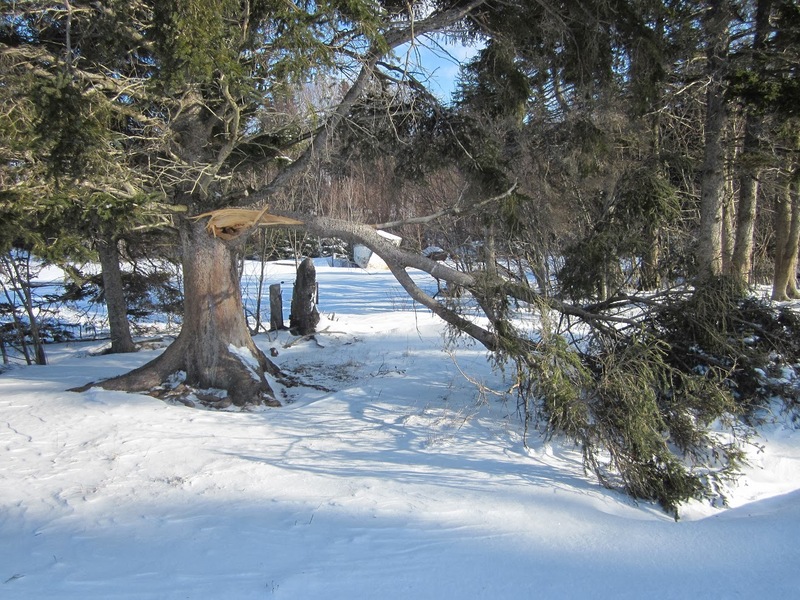 This large branch is of a large pine tree, it appears the ice storm did some pruning. It was overcast at 2 when hiking but started to rain as I was driving home. It rain all day at +1. Changing to snow sometime this evening. 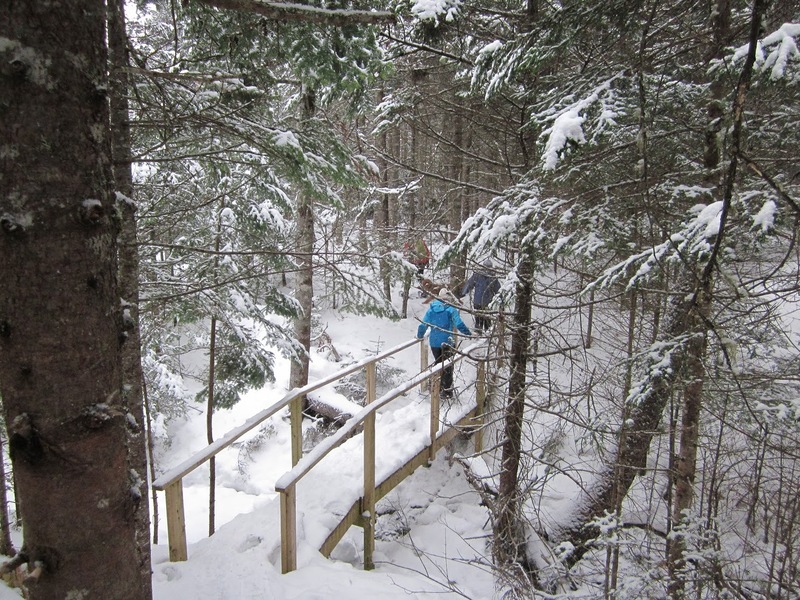 I and five others hiked the part of the Dromore trail on snowshoes this morning. 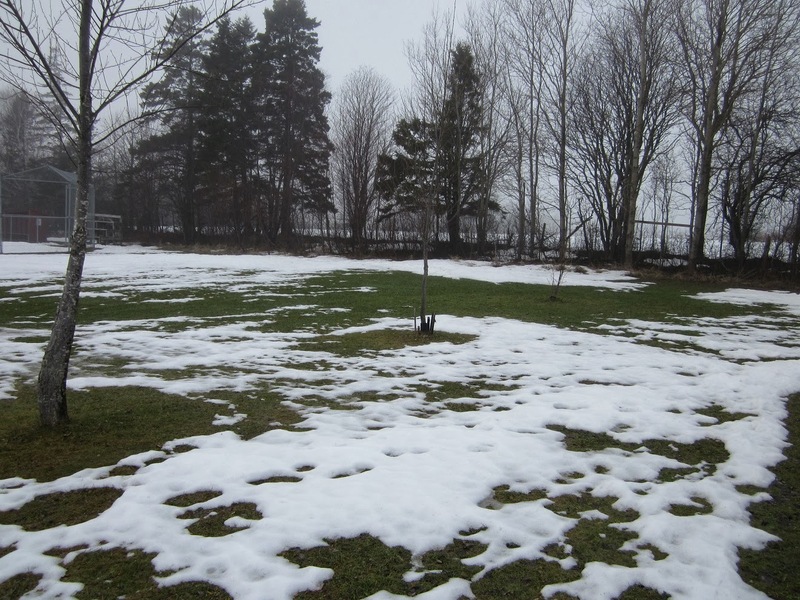 The wet snow made for poor conditions. We were out for two hours and I logged 4.8 km on the GPS. 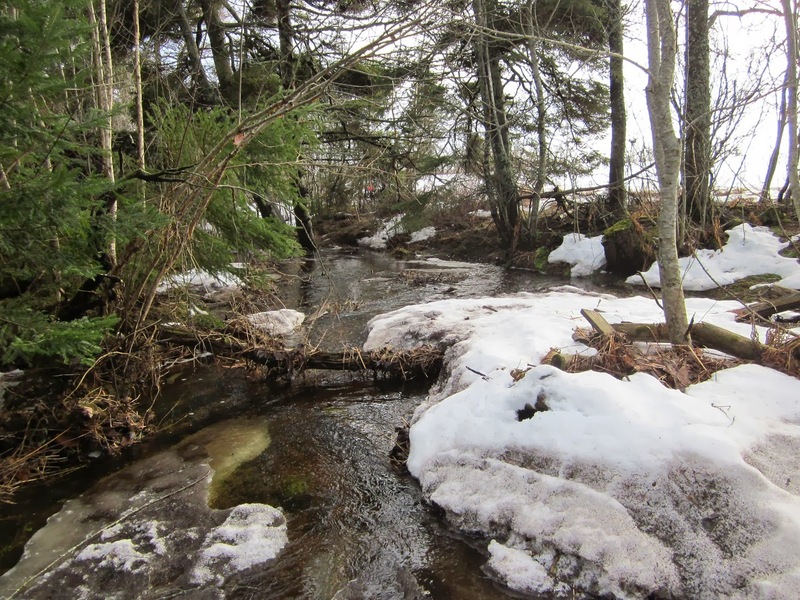 Lots of water running in the brook and under the snow in places. It had rained last night and the temperature had been seven but now down to three. I was cycling for a hour or more during the afternoon and attended a radio club meeting this evening. 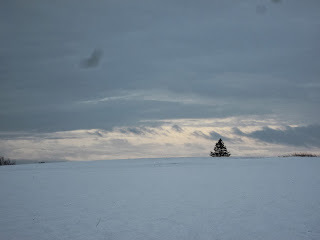 Around 2:00 I went out on the snowshoes for 45 minutes, it was mostly a cloudy day but the sun was trying to peek out. 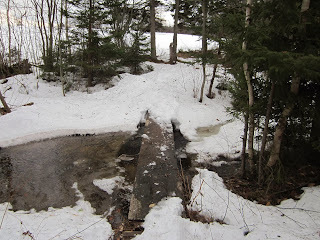 At the little bridge there was a good flow of water in the creek. The temperature was around 6 with light wind. I attended a cycling meeting in the morning and the wake of a radio club member at 4:00 PM.